Poor subjective sleep quality in undergraduate students has not been widely studied in Bandung city, Indonesia. Poor sleep quality has been related to a number of risk factors for poor health outcomes. To analyze the association between psychological distress and subjective sleep quality. A cross sectional survey was done in one of the universities of Bandung city, Indonesia. Data were collected from 290 undergraduate students selected through consecutive sampling. Pittsburg Sleep Quality Index (PSQI) and Kessler-10 questionnaire were administered. The prevalence of psychological distress was well (43.1%), mild (28.6%), moderate (20.7%), and severe (7.6%). The overall sleep quality was poor and good in 84.5% and 15.5% of the students. There was a significant association between psychological distress and poor sleep quality (p=0.006). The multivariate analysis suggested that psychological distress was a predictor of poor sleep quality (OR 1.991; 95% CI, 1.311−3.026). There is a need for an awareness of the college resources to help manage the stress levels of students through effective coping strategy-related study habits. Keywords: Sleep quality, Psychological distress, Students, Kessler-10, Pittsburg Sleep Quality Index, Multivariate analysis. © 2018 Alfian et al. duration of sleep whereas the qualitative component is a subjective measure of the depth and feeling of restfulness upon awakening [5Buysse DJ, Reynolds CF III, Monk TH, Berman SR, Kupfer DJ. The Pittsburgh Sleep Quality Index: A new instrument for psychiatric practice and research. Psychiatry Res 1989; 28(2): 193-213. [http://dx.doi.org/10.1016/0165-1781(89)90047-4] [PMID: 2748771] ]. 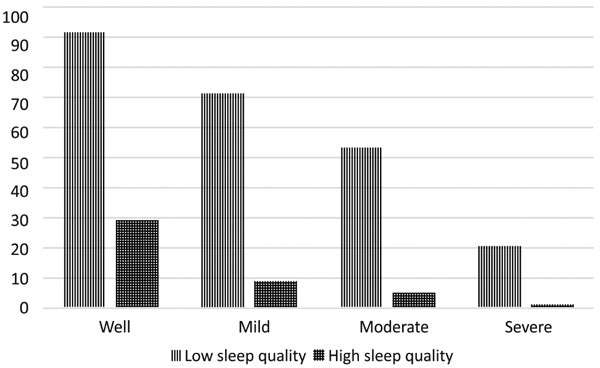 Poor sleep quality has been closely related to mood disturbance and a number of risk factors for poor health outcomes [6Riedel BW, Lichstein KL. Insomnia and daytime functioning. Sleep Med Rev 2000; 4(3): 277-98. [http://dx.doi.org/10.1053/smrv.1999.0074] [PMID: 12531170] ], including high blood pressure, increased body mass index and depression [7Shittu R, Issa B, Olanrewaju G, et al. Association between subjective sleep quality, hypertension, depression and body mass index in a nigerian family practice setting. J Sleep Disord Ther 2014; 3: 157. [http://dx.doi.org/10.4172/2167-0277.1000157] ]. Moreover, insomnia, poor sleep quality, and short sleep have been found to be correlated with high stress [8Fortunato V, Harsh J. Stress and sleep quality: The moderating role of negative affectivity. Pers Individ Dif 2006; 41: 825-36. [http://dx.doi.org/10.1016/j.paid.2006.03.024] , 9Knudsen HK, Ducharme LJ, Roman PM. Job stress and poor sleep quality: Data from an American sample of full-time workers. Soc Sci Med 2007; 64(10): 1997-2007. [http://dx.doi.org/10.1016/j.socscimed.2007.02.020] [PMID: 17363123] ]. A previous study showed that increased stress and reduced health-related quality of life were observed in the first 3 years of a PharmD curriculum [10Hirsch JD, Do AH, Hollenbach KA, Manoguerra AS, Adler DS. Students’ health-related quality of life across the preclinical pharmacy curriculum. Am J Pharm Educ 2009; 73(8): 147. [http://dx.doi.org/10.5688/aj7308147] [PMID: 20221340] ]. Interestingly, the literature on stress and sleep deprivation indicates that there might be a bidirectional relationship between these two variables [11Akerstedt T. Psychosocial stress and impaired sleep. Scand J Work Environ Health 2006; 32(6): 493-501. [http://dx.doi.org/10.5271/sjweh.1054] [PMID: 17173205] , 12Kim E-J, Dimsdale JE. The effect of psychosocial stress on sleep: A review of polysomnographic evidence. Behav Sleep Med 2007; 5(4): 256-78. [http://dx.doi.org/10.1080/15402000701557383] [PMID: 17937582] ]. The Pittsburg Sleep Quality Index (PSQI) is used for subjective assessment of sleep quality [5Buysse DJ, Reynolds CF III, Monk TH, Berman SR, Kupfer DJ. The Pittsburgh Sleep Quality Index: A new instrument for psychiatric practice and research. Psychiatry Res 1989; 28(2): 193-213. [http://dx.doi.org/10.1016/0165-1781(89)90047-4] [PMID: 2748771] ]. The Global Sleep Quality (GSQ) score is computed as the sum of response values for the seven components of the PSQI scale (sleep quality, sleep latency, sleep duration, habitual sleep efficiency, sleep disturbance, use of sleeping medication and daytime dysfunction) [5Buysse DJ, Reynolds CF III, Monk TH, Berman SR, Kupfer DJ. The Pittsburgh Sleep Quality Index: A new instrument for psychiatric practice and research. Psychiatry Res 1989; 28(2): 193-213. [http://dx.doi.org/10.1016/0165-1781(89)90047-4] [PMID: 2748771] ]. These instruments are used as general measures of sleep health and daytime dysfunction, and are not specific for any single primary sleep disorder. The PSQI has been widely translated and used in a wide range of both population-based and clinical studies [13Beiske KK, Kjelsberg FN, Ruud EA, Stavem K. Reliability and validity of a Norwegian version of the Epworth sleepiness scale. Sleep Breath 2009; 13(1): 65-72. [http://dx.doi.org/10.1007/s11325-008-0202-x] [PMID: 18560916] , 14Bertolazi AN, Fagondes SC, Hoff LS, et al. Validation of the Brazilian Portuguese version of the pittsburgh sleep quality index. Sleep Med 2011; 12(1): 70-5. [http://dx.doi.org/10.1016/j.sleep.2010.04.020] [PMID: 21145786] ]. Very few studies have been conducted to explore the sleep quality of Indonesian undergraduate students. Most of these studies focused on sleep patterns and fatigue [15Oginska H, Pokorski J. Fatigue and mood correlates of sleep length in three age-social groups: School children, students, and employees. Chronobiol Int 2006; 23(6): 1317-28. [http://dx.doi.org/10.1080/07420520601089349] [PMID: 17190716] , 16Tsai L-L, Li S-P. Sleep patterns in college students: Gender and grade differences. J Psychosom Res 2004; 56(2): 231-7. [http://dx.doi.org/10.1016/S0022-3999(03)00507-5] [PMID: 15016583] ]. Little is known about what factors contribute to poor sleep quality in this population. This study measures the association between psychological distress and poor sleep quality in a population of undergraduate students, and examines the factors that contribute to poor sleep quality. A cross-sectional survey was done in one of the universities of Bandung City, Indonesia. Assuming a prevalence rate of 32.5% [17James B, Omoaregba J, Igberase O. Prevalence and correlates of poor sleep quality among medical students at a Nigerian university. Ann Niger Med 2011; 5(1): 1-5. [http://dx.doi.org/10.4103/0331-3131.84218] ] as the best estimate of poor sleep quality among undergraduate students, a minimum sample size of 290 would provide true values at 95% confidence interval (95% CI) level. Thus, data were collected from 290 undergraduate students. This study was approved by the Universitas Padjadjaran Ethical Committee for Health Research (407/UN6.C1.3.2/KEPK/PN/2016). Informed consent was obtained from all undergraduate students after a full explanation of the purpose and procedures used for the study. All individuals who participated in this study signed informed consent forms (with anonymity and data confidentiality guaranteed), and all samples were taken in accordance with the Declaration of Helsinki [18World Medical Association. World Medical Association Declaration of Helsinki: ethical principles for medical research involving human subjects. JAMA 2013; 310(20): 2191-4. [http://dx.doi.org/10.1001/jama.2013.281053] [PMID: 24141714] ]. The students were recruited by consecutive sampling to complete a self-administered questionnaire. They were asked to provide demographic information, such as age, gender, body weight, and height. In addition, they were required to report on their performance in college, such as their latest semester’s cumulative Grade Point Average (cGPA). The psychological distress levels were measured by the Kessler-10 [18World Medical Association. World Medical Association Declaration of Helsinki: ethical principles for medical research involving human subjects. JAMA 2013; 310(20): 2191-4. [http://dx.doi.org/10.1001/jama.2013.281053] [PMID: 24141714] ]. The Kessler-10 is a measure of non-specific psychological distress experienced in the last 30 days, and is a reliable and valid indicator of current mental health status [19Kessler RC, Andrews G, Colpe LJ, et al. Short screening scales to monitor population prevalences and trends in non-specific psychological distress. Psychol Med 2002; 32(6): 959-76. [http://dx.doi.org/10.1017/S0033291702006074] [PMID: 12214795] ]. The psychological distress scores were grouped as follows well (0-20), mild (20-24), moderate (25-29) and severe (> 30) [20Furukawa TA, Kessler RC, Slade T, Andrews G. The performance of the K6 and K10 screening scales for psychological distress in the Australian national survey of mental health and well-being. Psychol Med 2003; 33(2): 357-62. [http://dx.doi.org/10.1017/S0033291702006700] [PMID: 12622315] ]. The PSQI is commonly used for the subjective assessment of sleep quality [5Buysse DJ, Reynolds CF III, Monk TH, Berman SR, Kupfer DJ. The Pittsburgh Sleep Quality Index: A new instrument for psychiatric practice and research. Psychiatry Res 1989; 28(2): 193-213. [http://dx.doi.org/10.1016/0165-1781(89)90047-4] [PMID: 2748771] ]. This instrument is a standardized quantitative measure of sleep quality with demonstrated high levels of consistency, reliability, and validity [5Buysse DJ, Reynolds CF III, Monk TH, Berman SR, Kupfer DJ. The Pittsburgh Sleep Quality Index: A new instrument for psychiatric practice and research. Psychiatry Res 1989; 28(2): 193-213. [http://dx.doi.org/10.1016/0165-1781(89)90047-4] [PMID: 2748771] , 21Backhaus J, Junghanns K, Broocks A, Riemann D, Hohagen F. Test-retest reliability and validity of the pittsburgh sleep quality index in primary insomnia. J Psychosom Res 2002; 53(3): 737-40. [http://dx.doi.org/10.1016/S0022-3999(02)00330-6] [PMID: 12217446] ]. The PSQI is a questionnaire consisting of 19 items that are coded on a 4-point scale (0-3) to obtain seven sub-categories, including sleep duration, sleep efficiency, sleep satisfaction, and medication use. The sum of all sub scores represents the total sleep quality score, ranging between 0 and 21, with higher scores representing lower sleep quality. The students were categorized as follows: good sleep quality (<5) and poor sleep quality (≥ 5). The students completed the Indonesian version of the PSQI. Height and weight were measured using the self-reported questionnaire. Body Mass Index (BMI) was calculated as weight in kilograms divided by height in meters squared2 (kg/m2). The international classification of BMI was used. The principal cut-off points were categorized as follows: BMI ≥ 30 (obesity); BMI between 25 and 30 (overweight), BMI < 25 (normal weight), and BMI ≤ 18.5 (underweight) [22World Health Organization. WHO: Global Database on Body Mass Index n.d. Available from: http://apps.who.int/ bmi/index.jsp ?introPage=intro_3.html]. The descriptive results were expressed as frequency, percentage, and mean ± standard deviation. Kolmogorov-Smirnov test was used to check for normal distribution. Pearson’s χ2 analysis was used to assess the differences in the frequency distributions between variables. The statistical significance was set at p < 0.05. In the multivariate analysis, multinomial logistic regression was applied to investigate the associations between sleep quality and psychological distress while adjusting for demographics (age, gender and c GPA) and BMI. A sample of 290 undergraduate students joined this study. Table 1 shows the socio-demographic information of the students. The students were predominantly female and ages 20 to 22 years old. Most students have normal BMI, are living alone, and receive tuition fee and life expenses from their parents. Two hundred forty-five students (84.5%) scored > 5 in the PSQI representing students with poor sleep quality, whereas 45 students (15.5%) scored ≤ 5 representing students with high sleep quality. There was a significant association between psychological distress and sleep quality (p=0.006). Socio-demographic and characteristics of students (n=290). The prevalence of psychological distress was well (43.1%), mild (28.6%), moderate (20.7%), and severe (7.6%). The overall sleep quality was poor and good in 84.5% and 15.5% of the students, respectively (Fig. 1 ). The multivariable-adjusted Odds Ratios (ORs) of psychological distress for the sleep quality are presented in Table 2. There was an increased likelihood of poor sleep quality score for those students with psychological distress (OR, 1.991; 95% C.I. 1.311 − 3.026). The overall sleep quality of the students. Multinomial logistic regression result for predictors of quality of sleep. The prevalence of poor sleep quality among the students in this study is 84.5%. This is much higher than the results of Suen [23Suen LKP, Hon KL, Tam WWS. Association between sleep behavior and sleep-related factors among university students in Hong Kong. Chronobiol Int 2008; 25(5): 760-75. [http://dx.doi.org/10.1080/07420520802397186] [PMID: 18780202] ] in the United States, who reported 42% and the findings of James [17James B, Omoaregba J, Igberase O. Prevalence and correlates of poor sleep quality among medical students at a Nigerian university. Ann Niger Med 2011; 5(1): 1-5. [http://dx.doi.org/10.4103/0331-3131.84218] ] at a Nigerian University with 32.5%. The high rate of poor sleep quality in this study might also be due to the fact that the students took an exam afterwards. This is in concordance with the finding that academic schedules play an important role in the sleep disturbance of college students [24Ahrberg K, Dresler M, Niedermaier S, Steiger A, Genzel L. The interaction between sleep quality and academic performance. J Psychiatr Res 2012; 46(12): 1618-22. [http://dx.doi.org/10.1016/j.jpsychires.2012.09.008] [PMID: 23040161] ]. There was no significant association between sociodemographic information and BMI and sleep quality. This result is similar to the finding of previous studies among Malaysian tertiary students [25Lai PP, Say YH. Associated factors of sleep quality and behavior among students of two tertiary institutions in Northern Malaysia. Med J Malaysia 2013; 68(3): 195-203. [PMID: 23749006] ] and Estonian medical students [26Eller T, Aluoja A, Vasar V, Veldi M. Symptoms of anxiety and depression in Estonian medical students with sleep problems. Depress Anxiety 2006; 23(4): 250-6. [http://dx.doi.org/10.1002/da.20166] [PMID: 16555263] ]. However, the result of this study is in contrast with the finding of Pearson et al., who found that obese patients have sleep difficulties [27Pearson NJ, Johnson LL, Nahin RL. Insomnia, trouble sleeping, and complementary and alternative medicine: Analysis of the 2002 national health interview survey data. Arch Intern Med 2006; 166(16): 1775-82. [http://dx.doi.org/10.1001/archinte.166.16.1775] [PMID: 16983058] ]. Further, the association of sleep quality with obesity was modified by perceived stress [28Bidulescu A, Din-Dzietham R, Coverson DL, et al. Interaction of sleep quality and psychosocial stress on obesity in African Americans: The Cardiovascular Health Epidemiology Study (CHES). BMC Public Health 2010; 10: 581. [http://dx.doi.org/10.1186/1471-2458-10-581] [PMID: 20920190] ]. The finding of this study might be due to the homogeneity of the students’ BMI. After multivariable adjustment, students with psychological distress had increased odds of reporting poor sleep quality (OR, 1.991; 95% CI, 1.311 − 3.026). Students with psychological distress were found to be 1.991 times more likely to have poor sleep quality compared to students without psychological distress. This result is in concordance with that of a previous study indicating that a higher global perceived stress is associated with poor sleep quality (r = 0.36) [6Riedel BW, Lichstein KL. Insomnia and daytime functioning. Sleep Med Rev 2000; 4(3): 277-98. [http://dx.doi.org/10.1053/smrv.1999.0074] [PMID: 12531170] ]. In addition, a high degree of depression and anxiety was found to be the influencing factor of poor sleep quality among Chinese adolescents [29Xu Z, Su H, Zou Y, Chen J, Wu J, Chang W. Sleep quality of Chinese adolescents: Distribution and its associated factors. J Paediatr Child Health 2012; 48(2): 138-45. [http://dx.doi.org/10.1111/j.1440-1754.2011.02065.x] [PMID: 21470332] ]. The effects of sleep disturbances in college students are substantial, such as an increased risk of mental illness [30Byrd K, Gelaye B, Tadessea MG, Williams MA, Lemma S, Berhanec Y. Sleep disturbances and common mental disorders in college students. Health Behav Policy Rev 2014; 1(3): 229-37. [http://dx.doi.org/10.14485/HBPR.1.3.7] [PMID: 25309939] ], impaired social relationships [31Carney CE, Edinger JD, Meyer B, Lindman L, Istre T. Daily activities and sleep quality in college students. Chronobiol Int 2006; 23(3): 623-37. [http://dx.doi.org/10.1080/07420520600650695] [PMID: 16753946] ], and reduced academic performance [32Curcio G, Ferrara M, De Gennaro L. Sleep loss, learning capacity and academic performance. Sleep Med Rev 2006; 10(5): 323-37. [http://dx.doi.org/10.1016/j.smrv.2005.11.001] [PMID: 16564189] ]. In a previous study of a large population of college students, students with poor sleep quality reported significantly more problems of physical and psychological health than did students with good sleep quality [1Lund HG, Reider BD, Whiting AB, Prichard JR. Sleep patterns and predictors of disturbed sleep in a large population of college students. J Adolesc Health 2010; 46(2): 124-32. 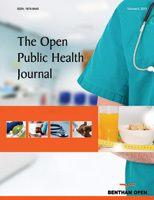 [http://dx.doi.org/10.1016/j.jadohealth.2009.06.016] [PMID: 20113918] ]. In addition, sleep deprivation has several adverse physiological consequences, including impaired glucose tolerance and insulin sensitivity, elevated sympathetic tone, increased inflammation, and the increase of ghrelin and decrease of leptin with the subsequent increase of hunger and appetite [1Lund HG, Reider BD, Whiting AB, Prichard JR. Sleep patterns and predictors of disturbed sleep in a large population of college students. J Adolesc Health 2010; 46(2): 124-32. [http://dx.doi.org/10.1016/j.jadohealth.2009.06.016] [PMID: 20113918] ]. Psychological distress can serve as a predisposing, precipitating, and perpetuating factor of sleep difficulties in this population. First, college lifestyle creates precipitating factors that enhance stress-related sleeping difficulties (e.g., erratic schedules and high-stress periods such as final exams). Second, the students may be more susceptible to hyperarousal-related sleep difficulties because of the maturational changes in the neuroendocrine system. Third, college students may have not yet developed sufficient strategies for handling stressful events and subsequently may experience more internalizing and worry [33Jose PE, Ratcliffe V. Stressor frequency and perceived intensity as predictors of internalizing symptoms: Gender and age differences in adolescence. N Z J Psychol 2004; 33: 145-54.]. Moreover, previous study showed that DNA methyltransferase 3A gene polymorphism contributes to daily life stress susceptibility among Indonesian healthy subject [34Barliana MI, Amalya SN, Pradipta IS, et al. DNA methyltransferase 3A gene polymorphism contributes to daily life stress susceptibility. Psychol Res Behav Manag 2017; 10: 395-401. [http://dx.doi.org/10.2147/PRBM.S152451] [PMID: 29290696] ]. Thus, biological factors may provide a predisposition for stress-induced sleep difficulties. Common stressful events in this population (e.g., midterm examinations and relationship troubles) and worry can accelerate sleep difficulties [1Lund HG, Reider BD, Whiting AB, Prichard JR. Sleep patterns and predictors of disturbed sleep in a large population of college students. J Adolesc Health 2010; 46(2): 124-32. [http://dx.doi.org/10.1016/j.jadohealth.2009.06.016] [PMID: 20113918] ]. The current pharmacy curriculum emphasizes the importance of time and self-management skills due to the overload of the academic course (assignments, laboratories, presentations, and examination). According to the Accreditation Council for Pharmacy Education (ACPE), colleges and schools of pharmacy should actively investigate the students’ levels of stress [35Accreditation Council For Pharmacy Education. Accreditation standards and guidelines for the professional program in pharmacy leading to the doctor of pharmacy degree 2015. Available from: https://www.acpe-accredit.org/pdf/Standards2016FINAL.pdf]. Such analyses can be used in various stress management programs that could result in the elimination of certain stress-causing activities, possibly improving the students’ overall health and academic performance. Only a few colleges and schools of pharmacy have published findings on student stress, especially from a 4-year PharmD curriculum [36Canales-Gonzales LP, Kranz PL. Perceived stress by students in a pharmacy curriculum, education. Education 2008; 129: 139-46.]. This finding may provide us the motivation needed to modify the curriculum to reduce psychological stress among college students. This study had several limitations. First, the generalizability of this study may be limited since the study sample represented only for the selected student population. The subsequent studies should include a larger and more diverse group of students to ensure generalizability. Second, our data relied on the students’ self-reported data and may have contained recall bias. In addition, there was no objective sleep assessment using polysomnography or actigraphy devices or stress symptoms collected clinically. However, the Kessler-10 and the PSQI are both validated measures and the most widely used self-reported measures of the psychological distress and sleep quality. Thus, it is unlikely that our estimates are seriously underestimated. A large proportion of college students in one of the universities in Bandung City, Indonesia have poor sleep quality that is associated with psychological distress. There is a need for an awareness of the college resources and curriculum to help manage the stress levels of students through effective coping strategy-related study habits, time management, and self-management. This study was approved by the Universitas Padjadjaran Ethical Committee for Health Research (407/UN6.C1.3.2/KEPK/PN/2016). We would like to thank the students that participated in this study. Jose PE, Ratcliffe V. Stressor frequency and perceived intensity as predictors of internalizing symptoms: Gender and age differences in adolescence. N Z J Psychol 2004; 33: 145-54. Canales-Gonzales LP, Kranz PL. Perceived stress by students in a pharmacy curriculum, education. Education 2008; 129: 139-46.